Bye Bye Benji: Who wanted who? 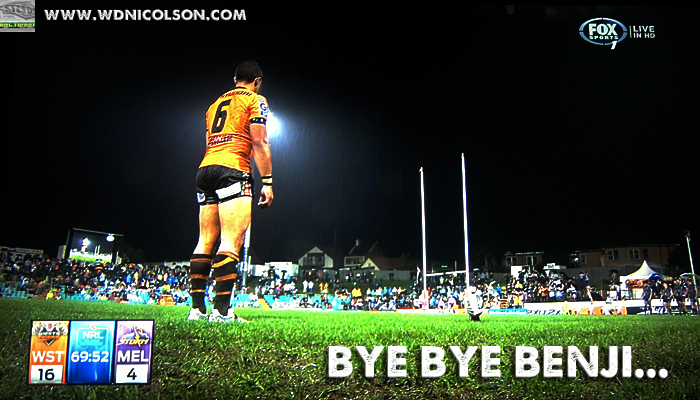 Benji Marshall is 28 years old and 'signed' until the end of 2015 with the Wests Tigers. He made a 'handshake agreement' with the former club management that he would have an upgraded deal in place sometime before his current deal expired - extending his stay at the Wests Tigers until the end of 2017. The Wests Tigers have new management and a new coach... neither of which were in place when Marshall extended his current deal to the end of 2015. The Wests Tigers have not been able to come to the party with an upgraded deal for 2016-2017 that is to Marshall and his agent Martin Tauber's liking in the last six months since Tim Sheens was shown the door as coach of the club. Benji Marshall has said he will not play against the Wests Tigers due to loyalty... the Wests Tigers could enforce that 'loyalty' by granting Marshall a release that stipulates Marshall cannot play for another NRL club for the duration of the current deal that expires at the end of 2015. Did Benji feel slighted by the new regime? Did the new regime decide he's not worth the bigger cap hit in the new salary cap market? Or is is a bit from Column A and a bit from Column B? One gets the feeling it is a mutual parting of ways... but if the Wests Tigers had planned to alienate Marshall just enough to make sure they don't have to pay him $700,000+ a season (or whatever he wanted) and yet not have him play against them in the NRL. They've done a wonderful job executing that plan. UPDATE 6pm: The Wests Tigers did release this 'open letter' to their members and fans late Tuesday... when you compare their assertion that Marshall's decision is not about money with his manager's assertion that the club let his client down by not upgrading his deal... well this evening's development have made things as clear as mud. Benji Marshall is going to the NSW Waratahs to play Super Rugby. And you know what... as much as I personally (not a Tigers fan) want to see him stay in the Greatest Game of All - either at the Tigers or another club in Australia; he is 28 years old and realistically at that age - his next contract is his last opportunity to play another top level code. The Wests Tigers think they are doing the right thing not investing significant chunk of their salary cap into a 28 year old playmaker who has not shown as many flashes of brilliance in the last 12 months as they would like... yet still pay Adam Blair a ridiculous amount of money to show next to nothing at all. But I've had discussions with a number of Wests Tigers fans lately about the speculation surrounding Marshall's status and we can't understand how not having Marshall as part of the team when the best young talent comes through is anything but a positive? Luke Brooks, Mitchell Moses etc might well carve up the lower grades like a Christmas Cake but if they come into first grade with Robbie Farah at 9 and Marshall alongside either one of them in the halves - aren't the Wests Tigers actually better placed to win a competition than without Marshall? Farah turns 30 next season... which means he is OLDER than Marshall. And while he is skilful enough to play into his mid-30s... why do Wests Tigers management think Marshall isn't? At best Farah probably has 5 seasons left in him... Marshall missed significant time in his formative seasons so his body isn't as run down as Farah's... so why isn't it a good decision to help the next generation through their own formative years with two of the best players on the planet in their final seasons by their sides? The Wests Tigers with Farah and Marshall can still contend in today's NRL - where top shelf talent gives you a shot entering September - and that's what boggles the mind with the decision not to re-sign Marshall. So can the Wests Tigers realistically contend in Farah's final years without Marshall? Brooks or Moses could be sensational in the top grade but at absolute best 2015 shapes as their first crack at a real title run... and even if they need until 2016 or 2017 to be at their best - Farah will be 32 or 33... and at the very back end of his career. Plus you have to throw in the undeniable fact that Marshall - along with Farah and arguably the most important piece - Tim Sheens - delivered a long awaited Premiership to the Tigers in 2005... one that didn't look at all likely before that trio came together. So any fan (or indeed new management) blowing up at Marshall now (for this decision or his recent form) - should be reminded of that and promptly put in their place. But by sending Marshall a message 'we don't think you are worth the money you want anymore' - how can that be the case? So is it any wonder why Marshall is getting out of dodge and Robbie Farah is rather perplexed? NOPE... sadly not at all. But if this is the way the Wests Tigers wanted things... they got it. And one final point... wasn't one of the key reasons the Wests Tigers decided to part with Tim Sheens all about making sure Benji and Robbie would be 'refreshed' for another title run together before the end of their career? PS. If Benji is indeed destined for Super Rugby - get along to a Wests Tigers game asap... in fact Friday Night is Benji's last game at Leichhardt everyone. Yep the LAST ONE. Be there.